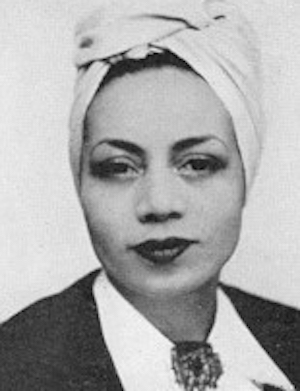 Jeanne (Jane) Vialle was a black French journalist and senator coming from the French colonies, born on 27 August 1906. She is one of the rare French women senators of her time and one of the first black persons to be elected to the French Senate. Jeanne Vialle was born in Ouesco in French Congo. She studied in Paris at the Lycée Jules Ferry and obtained her baccalauréat. Then she became a journalist at Opéra Mundi, an information agency. In 1940 she entered in the resistance against the Fascists and Nazis’ occupation. She was arrested in Marseille in 1943 and sent to jail, but before the end of the war, she escaped. Because of her actions, she was awarded the Resistance Medal by the French government. After the end of World War II, Vialle started a career in the Agence France-Presse (AFP) where she focused on the French institutional reconstruction. As a woman from the colonies, she monitored the different signs of progress regarding the relationship between France and its colonies existing through the French Union (l’Union Française), created by the fourth Republic in 1946. As a correspondent with newspapers of French West Africa, she kept a close watch on the two constituent assemblies building the fourth French Republic (1944–1958). This “reconstruction” aimed to reaffirm French cohesion between the metropolis and the colonies based on a colorblind equality of rights. Vialle monitored this evolution, this progressive emancipation. In July 1946, she founded her own political party: l ’Evolution pour l ’Afrique Noire (APEAN; Association for Evolution of Black Africa). In January 1947, because she participated in numerous conferences in many French “overseas” departments, she decided to be a candidate in Oubangui-Chari (now the Central African Republic) for election to the “Republican Council” (Le Conseil de la Republique), the new French senate. Vialle was elected on 10 January 1947 and decided to join the socialist group in the council. She was reelected on 14 November 1948. She sat in the economic committee of the Senate and was also a member of the Committee of the France from Overseas (Commission de la France d’Outre-Mer), and a member of labor and social security. In 1950 she joined the council’s Committee of National Education. Vialle created l’Association des Femmes de l’Union Française (AFUF; Women’s Association of the French Union) for the women of French Union to finance education, instruction of girls in colonies (needed, according to Vialle, in order to have a general improvement of the African society). In 1947 she proposed motions regarding the equality of French citizens, especially between citizens from metropolis and citizens from overseas. To do so, she supported the application of the constitution approved in October 1946. She fought in 1949 and 1950 to spread education in colonized territories, to improve the school program in the French Africa. She made also a law (carrying her name) concerning paternity research in the territories overseas. Finally, she tried to improve the social development of French Africa by fighting against the alcoholism and increasing the number of social assistants. In an international field, she sat in the early 1950s as the French representative in the United Nation (UN) Committee on Slavery. Vialle was a candidate for reelection as senator, but she was defeated on 18 May 1952. Jeanne Vialle died on 9 February 1953 in a plane accident in Villenave d’Ornon in the South of France. French Senate Website: https://www.senat.fr/senateur-4eme-republique/vialle_jane0151r4.html; Richard A. Bradshaw et Juan Fandos Rius, « Jane Vialle » in Dictionary of African biography, (New York: Oxford University Press, 2011): http://www.oxfordreference.com/view/10.1093/acref/9780195382075.001.0001/acref-9780195382075-e-2102?rskey=UBJOqQ&result=2102; Jean-Dominique Pénel, Barthélemy Boganda, Antoine Darlan, Jane Vialle, trois représentants Oubanguiens du deuxième collège 1946-1952, (Bangui : Université de Bangui, 1985).